 Just in case you don’t know what to do over Christmas, you can still book the ‘Christmas Truce Centenary Tour’ from 23 to 27 December sold by the Edinburgh-based tour operators Mercat Tours. The programme includes of course a football match on the Flanders fields where the famous Christmas Truce matches between British and German soldiers are supposed to have taken place. 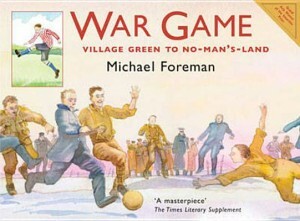 The story of these improvise kick-arounds is one of the most endearing anecdotes of World War I: British and German soldiers are said to have left their trenches spontaneously on Christmas day, smoked some cigarettes together in the no-man’s land, suddenly produced a ball and engaged in an unorganised football match, with over 30 on each side and no one keeping score. The story has been turned into a very nice animated short film named ‘War Games’ (Dave Unwin, 2001, 29 min., based on the 1989 children’s novel by Michael Foreman) and it played a key role in the 2005 major French movie ‘Joyeux Noël’ by Christian Carion (see trailer here). 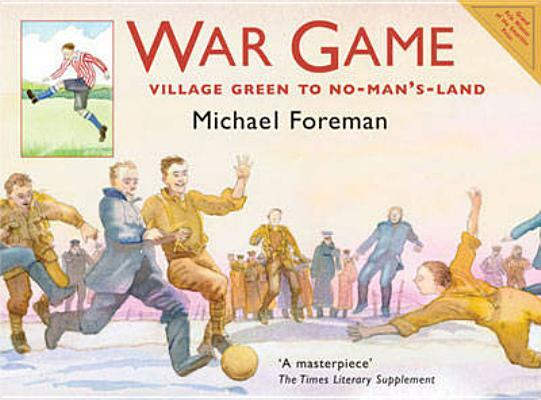 War Game – a children’s novel and animated film. It’s a great story, with decent ordinary people disregarding, if only for a short moment, the order from above to kill each other. According to some reports, spontaneous truces like this were observed at various points in Flanders and Northern France. Unfortunately, despite the numerous photos taken on the front in these days, no one seems to have bothered to take one of any of these matches, and some doubts remain about the veracity of this football fraternisation. Are we to believe the reports in several British newspapers dated January 1915, or are they actually some kind of propaganda with the aim to distinguish between ‘good’ Germans (Saxons, Swabians and Bavarians) and ‘evil’ Prussians? Was the story actually eagerly picked up, embellished and spread by post-war pacifists who, understandably, saw it as a good illustration of the absurdity of it all? Or cultivated by promotors of football with the objective to praise the game’s capacity to bring people together? According to the French historian Paul Dietschy, serious historical research can only confirm these doubts. Most of the available witness reports are from someone who simply ‘watched’ one of these matches or ‘heard from someone else’ about them. On the other hand, over the last years, several of the former World War soldiers who were still alive at the beginning of the 21st century, confirmed the improvisation of such rather chaotic matches. One of them, Bertie Felstead, who died in 2001 aged 106, explicitly recalled that ‘it wasn’t a game as such, more a kick-around and a free-for-all; there could have been 50 on each side, for all I know’. According to him, it probably did not last much more than half an hour.  Paul Dietschy concedes that if such a Christmas match took place, it certainly was in 1914, when the no-man’s land, despite the pieces of barbed wire and unexploded ammunition that were already lying around, was not yet as much turned upside down as in the following months and years. The trenches had only been dug some weeks before Christmas, and it is also certain that in many British batallions footballs were available. For the Germans, this is less likely, as the game was then still a rather bourgeois practice and, as the German historian Christiane Eisenberg points out, a sport that was not very equally spread in both social and geographic terms. One way or another, it is actually not so important to know whether they actually did play or not. The question is not so much whether the matches are a historical fact, but rather what memory is created out of touching story. Even if the matches never really happened, our desire to commemorate a moment of humanism in the nightmare of the World War trenches simply wants the story to be true. 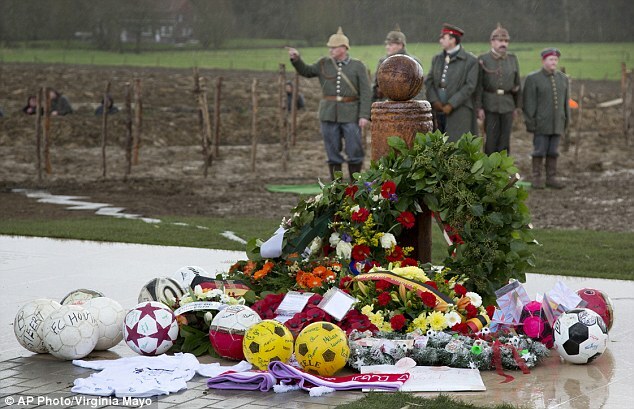 11 December 2014: Inauguration of the Christmas Truce memorial at Ploegsteert. In a few years, memory will have replaced history altogether. The commemoration craze of 2014 cannot afford to have doubts. A recent book by a Belgian journalist appears to have ‘irrefutable’ new sources, quoting the notes of the German soldiers and alleged eye witnesses Johannes Niemann and Kurt Zehmisch. 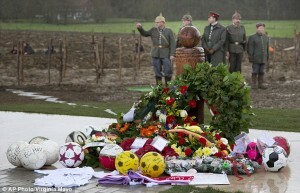 And now that the small Flemish town of Ploegsteert has made the memory even more concrete in a momument that was officially inaugurated on 11 December by Michel Platini himself, the Christmas Truce has irrevovably become the Christmas Truth. What a wonderful contemporary case study for the construction of a lieu de mémoire ? All it takes is a story that is too good not to be true, a strong collective desire to celebrate human beings rather than war heroes, and a fast-growing sector of commemorative tourism that allows local politicians to combine sincere humanistic beliefs with economic potential. If the future visitors of the football monument at Ploegsteert also take the time to visit, for instance, the excellent exhibition in the huge Cloth Hall of Ypres and one of the numerous cemetaries that cover Flanders, the Christmas Truce story will have contributed to a good history lesson. 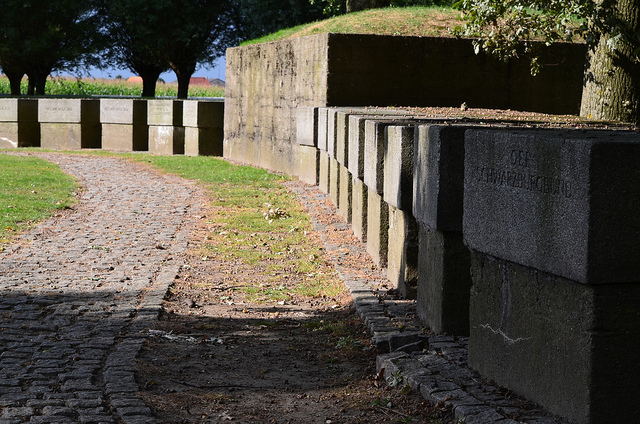 The Langemark cemetary in Flanders. To anybody interested in the history (not memory) of sport, I would personally recommend the Langemark cemetary, which gives evidence to how thousands of Prussian students, entire ‘Studentenschaften’ deeply nationalised by the gymnastics movement (‘Turnen’) and brainwashed by the propaganda of the Kaiserreich, enthusiastically volunteered to get slaughtered in what they no doubt believed would be a kind of great sports event. They were told they would be home by Christmas. But a hundred Christmases later, they’re still in Flanders. The proximity of Ploegsteert and Langemark – a mere 30-minute drive – is an excellent illustration for the fact that sport is neither essentially good nor bad. It is what the circumstances, the zeitgeist, and the dominant discourse make of it. Iain Adams and Trevor Petney, ‘Germany 3 –Scotland 2, 25th December, 1914: Fact or Fiction’, in Jonathan Magee, Alan Bairner & Alan Tomlinson (ed. ), The Bountiful Game? Football Identities and Finance, Oxford, Meyer & Meyer Sport, 2005, p. 21-41. Christiane Eisenberg, ‘English Sports’ und deutsche Bürger. Eine Gesellschaftsgeschichte 1800-1939, Paderborn, Schöningh, 1999. Stanley Weintraub, Silent Night. The Remarkable Christmas Truce of 1914, London, Simon & Schuster, 2001.